1995 was the year I had my first bagel, it was the year after I finished school and went as an Au Pair to New York. The year did not start of very well since I had to change families after 5 weeks since my first one was not a family you want to live with for a year. The Au Pair after me actually left 3 days after she was moved into the family. The secret to bagels is a bath in boiling water, this is what makes them so gooey. Then I was lucky and could spend the rest of my year was a nice family in Harrison, New York with two teenager boys and a cute dog named Max. My host Mum would drive Saturday morning or Friday night to Stew Leonard’s, this amazing supermarket where you can pick your own corn, watch the popcorn or cookies being made and yes, fresh bagels. The perfect bagel is kind of crisp on the outside and, I like mine toasted, even then still gooey on the inside. The structure of gluten-free is always a bit different from regular once but still they have that. The typical none vegan New York Bagel is eaten with lots of cream cheese and smoked salmon or lox as they call it and some red onion. Have to say, not a huge fan of smoked salmon but with cream cheese on an amazing bagel and some red onions, we do have a winner. But the Gluten-free Sesame Bagels also work nicely with jam like my Strawberry Chia Jam or some chocolate spread. I remember whenever anyone came from Germany to visit me they had to bring chocolate and lots of Nutella. Whenever I am in New York I buy two big bags of bagels, one regular for my family and friends and some gluten-free begals for me. In Germany you can buy bagels too but most of them taste more like rolls with a hole then bagels. I believe a lot of them are missing the bath in some boiling water. Put flour, starch, flax meal, chia seeds, salt, xanthan gum, egg and yeast in a bowl and mix well. In a seperate bowl whisk together molasses, sugar, oil, cider vinegar and warm water. Add the mixture to the dry ingredients above, whisk with a mixer until it has a smooth consistency. Beat for about 2-3 minutes. Be careful will be kind of sticky. Let the dough rise in a warmer environment for around 30 minutes. Sprinkle some corn flour on a baking sheet and start preheating the oven at 375° Fahrenheit. Then form little balls with the dough and poke your finger in the middle, making a hole. Place the bagels on the baking sheet. Wrap with some cling foil that you oiled. In a warm place let the bagels rise for another 30 minutes. When the bagels have risen bring a big pot of water with a teaspoon salt and a teaspoon molasses and sugar to boil. Drop a few bagels into boiling water, simmer for 30 seconds on each side, take them out and drain excess water on some kitchen towel. 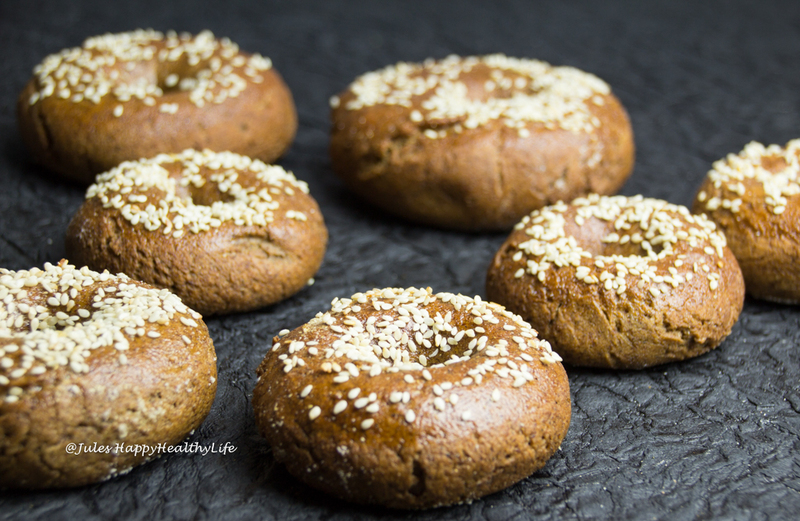 Bake the bagels for 10 minutes then dunk each bagel first in some egg white and then the sesame seeds. Afterwards bake for another 20 minutes. The bagels are best right out of the oven, otherwise freeze them and take them out the night before. Next day, cut thme in half and toast them or reheat them in the oven.